Vegetables that are ideal to julienne into vegetable noodles have very distinct characteristics best displayed in easy to grow heirloom vegetable cultivars. This year I’m definitely going to grow noodles in my garden. I love vegetable noodles. They satisfy a craving for comfort food without the extra calories and without the blood sugar hit that regular, starchy pasta gives. Some vegetables are easier to make vegetable noodles from than others. Round vegetables and small vegetables are harder to draw the julienne peeler across. These may be great additions to a vegetable dish but they won’t allow you to make long, satisfying vegetable noodles. So with that in mind, I’m planning to grow some special heirloom varieties that will make the very best vegetable noodles and zucchini noodles. 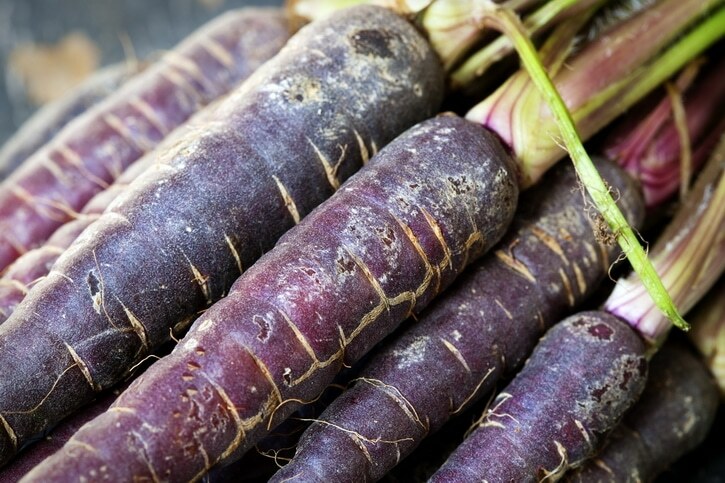 Regular carrots make good julienne vegetables but to get long, firm noodles the heirloom Amarillo carrot is your best cultivar. 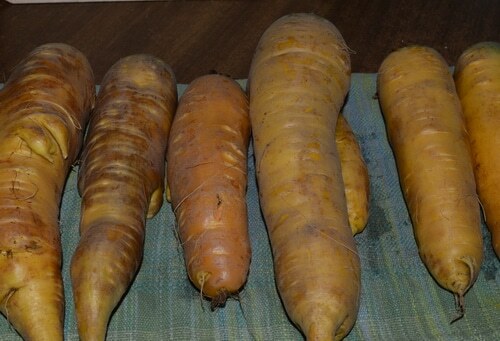 A heritage carrot, Amarillo carrots are large, thick and yellow fleshed. They are tender right through the core. Left in the garden past the normal harvest window, they continue to grow to huge sizes, and the core remains tender-crisp. One carrot is enough to serve 4 people as a main dish. Because of their size, Amarillo carrots should be well spaced when you plant them. Use a seed tape and plant your carrots 2 inches apart in rows at least 8 inches apart. After the carrot seedlings emerge and start to grow, thin the plants to 4 inches apart – eating the first thinnings. Keep it well weeded and mulched to conserve water. These carrots can grow 10 inches long and 2 inches in diameter at the shoulders if you give them what they need to grow big. Plant them a week before your expected last frost date, and harvest them in September. They can withstand a mild frost. Protect them from carrot rust fly with a row cover. In cold weather areas, you can get a head start on your growing season by covering them with a cloth row cover after planting, and again in the fall after your first frost. Long zucchini and yellow squash cultivars are ideal for vegetable noodles. When young, the tender skin can be utilized as well as the inner flesh. You can julienne right through the seed core on immature zucchini and summer squash. You can also allow a few squashes to grow to torpedo size and harden off for winter. I do this every year to gain some squash to feed the chickens in January and February. Hardened off summer squash will stay good in cold storage until March. This seasoned summer squash can be peeled and the seeds removed (save some for next year’s garden) and then the white flesh can be julienned for vegetable noodles. My favorite cultivar is Romanesco Zucchini, an Italian heirloom that tastes like hazelnuts when raw. It is a prolific, bush-type zucchini that will grow upward and produces zucchini from first flowering until frost. Grow at least three plants so that there are always enough male flowers to fertilize the opening female flowers. For me, the bushy plants produced several more female flowers to every male flower that opened. The Romanesco zucchini has ribbed sides rather than the round, smooth sides of other zucchinis. The ribbed sides make it less roly-poly on the counter when you are trying to julienne it. It may be my imagination, but this variety seems less watery to me, too. 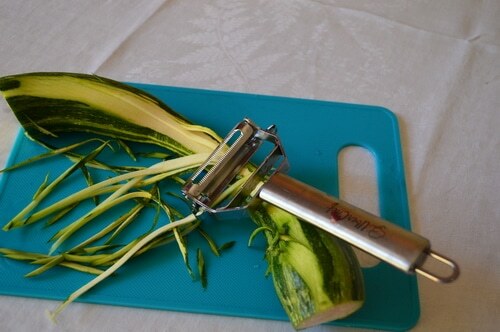 For more on how to make zucchini noodles see this post. You want to grow long, cylindrical beets if you plan to make beet noodles. Round beets are too short and the spherical shape is awkward to slide the peeler over. 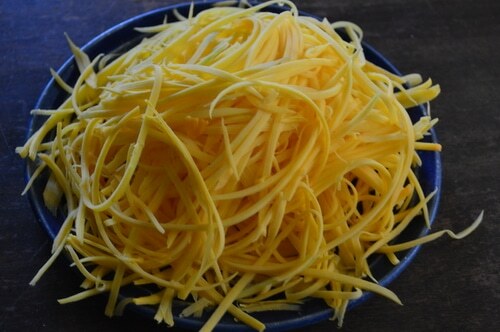 The best varieties to make vegetable noodles from are Taunus and Cylindra. Beets are high in betanin, a colourful, water-soluble compound that inhibits the growth of cancer cells through anti-angiogenesis, cutting off their blood supply. 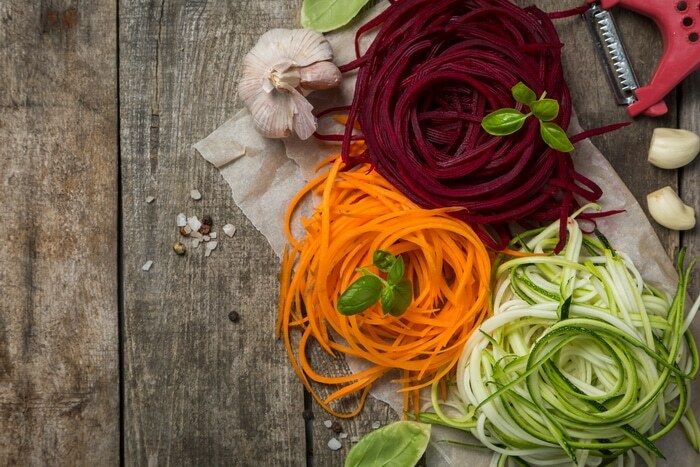 Deep crimson julienne beets contrast beautifully with yellow carrots, and pale green-flecked, zucchini noodles in a dish. Lightly stir fry to retain the bold colour and healthful anti-angiogenesis compounds. Butternut squash is easy to peel. And the fruit is just the right size for main dish noodles. The flesh is dark orange, sweet, firm, and stringless. I like to cut the cylindrical top from the swelled seed cavity, using the top part for vegetable noodles and the bottom of the fruit for soup or stir-fry. One average butternut squash will serve 4 people for two meals. If you add butternut squash noodles to soup, add them in the last 10 minutes of cooking time. And serve the soup as soon as the noodles are limp. If simmered too long, butternut squash noodles will dissolve in the broth, thickening the soup. 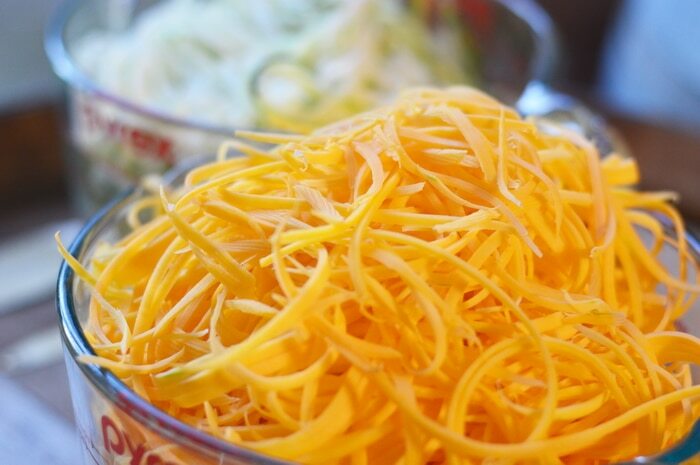 Butternut squash noodles can also be steamed or stir-fried. Heritage butternut squash like Tromboncino has long fruit with small seed cavities. If you have a lot of noodles to make this may be a good variety to grow. Tromboncino can be used as summer squash or allowed to mature and used as winter squash. If you use it as a summer squash the flavour is unique and a little sweeter than zucchini. It can be trellised to give you a lot of food in a small space. The hardened off winter squash will keep a long time in cool storage over the winter. You’ll use a little bit of the squash each meal until the whole squash is used up, just refrigerate the unused portion. Heritage Waltham butternut has a smaller blockier fruit that can be used up in one meal. The flavour is sweet and the flesh is string-less. It is very good for butternut squash noodles. The length of your growing season should factor into which variety you’ll want to grow in your own noodle garden. In Grand Forks, BC (zone 4) both Tromboncino and Waltham are grown successfully. Here on the mountain (zone 3), I can get immature fruit from the Tromboncino but my season isn’t long enough to harden it off for winter keeping. While pumpkin is a spherical vegetable rather than cylindrical, because of its size it is still a good choice for vegetable noodles. Pick a variety that is grown for pies rather than the jack-o-lantern type. These have thicker, denser, sweeter, and less watery flesh, without stringiness. Two of my favorite thick fleshed pumpkins are Rouge Vif d Etampes or Cinderella pumpkin and Galeux d Eysines, with its warty skin and thick, sweet, deep orange flesh. These are both sweet and flavourful and grow well if you have at least 110 days of frost-free growing time. In a shorter growing season start them indoors in peat pots and provide both protection from cold and a heat sink in the bed – such as some large rocks painted black to hold in the heat. To cook pumpkin noodles, lightly steam or stir fry. If cooked too long they will turn to mush, like butternut squash. Read the article Growing winter squash to feed your tribe through the winter for more growing ideas. Winter keeping radishes are mild tasting, grow quickly and can be planted in July for a fall harvest. They are best protected from flea beetles and carrot rust maggot with a row cover. Diakon types are long and thick with sweet, slightly pungent white flesh. They are moist and make a good raw noodle salad. They can also be added to other stir fried noodles in the last two minutes of cooking time. They will keep for quite a few weeks in the crisper of your fridge or buried in sand in your root cellar. They go well with mung bean sprouts in a raw salad. You can grow bean sprouts as you need them throughout the year to add to an amazing vegetable noodle salad or stir fry. Elongated Chinese Green Luobo Radish radishes with their green skin and pale green flesh are not as watery as daikon and when stir-fried have a taste that is similar to turnips and rutabagas. Sweet potatoes require a long, warm growing season. While none are cold hardy, there are some cultivars developed for shorter growing areas. You can grow sweet potatoes if you can keep the ambient temperature above 60F for at least 3 months of your growing season. Once harvested sweet potatoes need to be cured to increase their storage time. If you can give them what they need, sweet potatoes make delicious paleo noodles to top with your favorite pasta sauce. Check out this article on growing sweet potatoes in your short season home garden. It can help you beat cancer. A diet rich in colourful fruits and vegetables has been scientifically proven to cause anti-angiogenesis in cancer cells, effectively starving them. For the strongest anti-angiogenesis effect, cook by lightly steaming or stir-frying or consume raw and minimize the time between julienning and eating. The bioactive compounds decrease as they are exposed to air. Avoid boiling them. Creating a colourful vegetable noodle dish combines a variety of anti-angiogenesis foods taking advantage of their synergistic effects. It can help you lose weight. When you increase the colourful vegetables in your diet you also cause anti-angiogenesis to fat cells. And over time this will contribute to weight loss. Use the same chopping and cooking precautions as with cancer prevention. The long cylindrical varieties of vegetables that make the best vegetable noodles are difficult to find in the grocery store. When you grow them yourself you can have a dependable supply and you aren’t subject to the vagaries of the market. All of these 7 heirloom varieties not only make good noodles, but they can also be kept in cool storage through the winter, to give you satisfying noodle comfort between growing seasons. This is important because many of the cancer-fighting compounds are water soluble and lost when the vegetable is preserved by canning or when they are chopped and stored in the freezer, exposing them to air. Preparing just before you are going to eat them, will ensure the maximum nutrition and benefit. When you grow these heirlooms and save their seeds you are joining in an honourable ancient practice to ensure genetic diversity and survival of these heritage vegetables, as well as survival of the human species. Further, saving seeds from vegetables that you grow yourself gradually improves the adaptability of plants for your growing area. Your turn, which vegetable noodles do you like best? 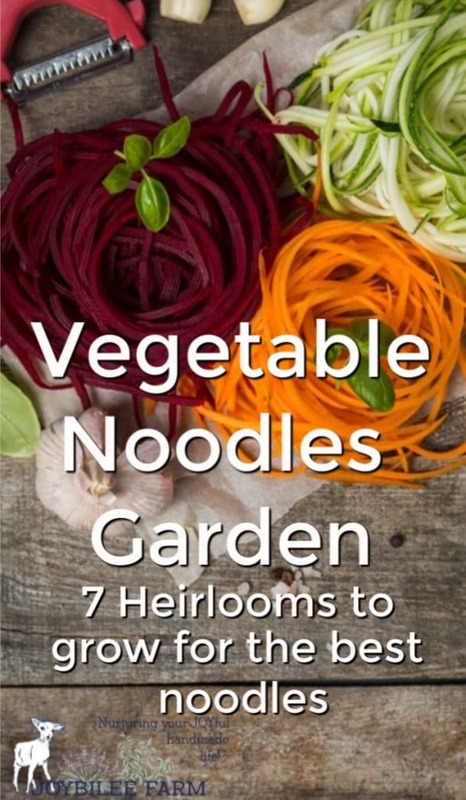 Is there an heirloom cultivar that I missed that you would grow and use for veggie noodles? I love this post – thank you, thank you!